You Oughta Know....our friend TaRee!! So y'all know how much we love music. Obviously. So, this will come as no surprise that we are recommending some new music for ya. 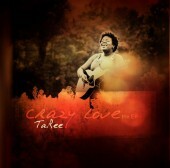 Do yourself a favor & check out our friend TaRee. She is a super soulful Gospel singer and released an awesome EP titled "Crazy Love" earlier this year. You will love her voice and her catchy songs. For real. Plus, she is a super sweet, bubbly person in real life. It's always nice to see people who enjoy what they do and you can definitely see that she loves to sing. You can check out her YouTube Channel with all sorts of amazing covers of popular songs. Our favorites from the EP are: "All We Are" & "Did You Know." Get to know her! TaRee...can't wait to see what you do next! Click here for past entries in the You Oughta Know Series.